Capacity: 350 cu. ft. The 1402H represents a heavy duty version. It features 1/4 inch tub walls and 5/8 inch auger flighting. Plus has the capacity for up to 9 knives. 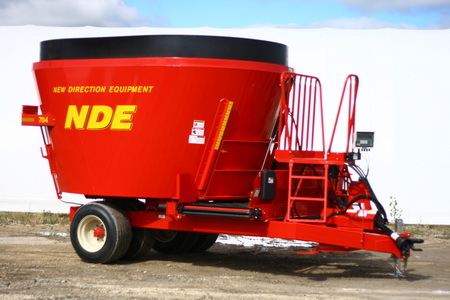 With a height of 100" this mixer was designed for dairy producer that prefer to load with a skid steer or situations where overhead clearance is an issue. Capacity of 610 cu. ft. Can handle 5 x 6 round bales and still have plenty of room for silage or other by-products. This side door mixer is available with conveyor lengths from 3 ft. to 9 ft. on either RH or LH side. With it's 610 cu. 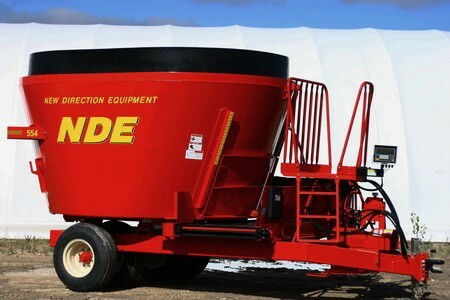 ft. tub, (with rubber top kit) this mixer is an excellent choice if you are looking for a mixer that will handle 5 x 6 round bales and still have plenty of room for silage or other by-products. This side door mixer is available with conveyor lengths from 3 ft. to 9 ft. on either RH or LH side. 620 cu. ft. capacity. Requires min. 110 HP tractor. 9 max mixer knives. Capacity of 435 cu. ft. 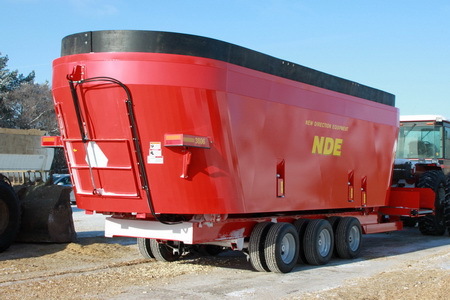 The 554 has been a powerful leader among medium size dairy producers with its 8 1/2 ft. wide tub and 101" loading height. It offers excellent capacity and great versatility. The 654 is a popular choice for dairy and beef producers that need more capacity but still want to stay with a medium-size mixer. Capacity of 520 cu. ft.
512 cu. ft. capacity. 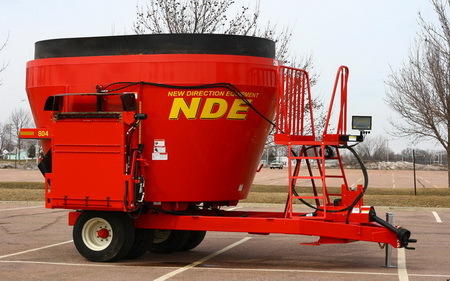 This 9 foot mixer has been a steady player in the dairy industry for many years. It is available with a 58" front door or LH, RH or double side door. This 9 foot tub model offers large volume and superior performance over most mixers in its class. It is available with a 58" front door or LH, RH or double side door. 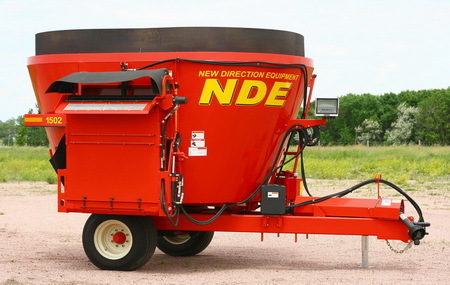 The NDE 804 has truly become a "workhorse" in the vertical mixer market. 865 cu. ft. With the addition of the 2 axle, spring type suspension, including eight LT235/75R-17.5 heavy duty tires. 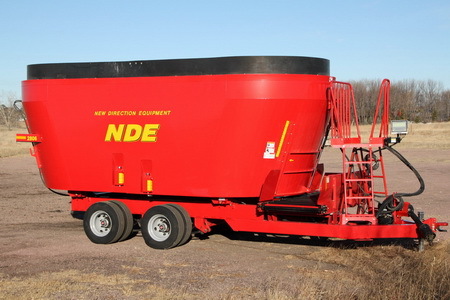 Along with the increased capacity over the 2554/2654, this mixer will soon become one of our most popular mixers for beef and dairy operations throughout the world. This mixer includes the patented and proven STEP FLOOR design. The front floor is now 4" lower than the rear, with a 6 inch overlap of the auger patterns. This new design has allowed more capacity without compromising our superior mixing and cleanout ability. 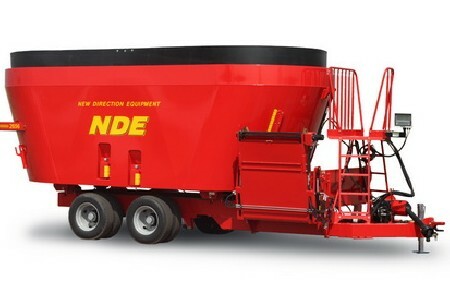 This mixer is carried by a 2 axle, spring type suspension. Including eight (8) LT235/75R-17.5 (18 ply rated) heavy duty tires. Capacity of 1,228 cu. ft. Min. HP of 190 required. Rubber extension sides available. Dual auger mixer. The 3806 features a Triple Auger design. With our patented and proven step floor design between each mixing compartment. Providing superior mixing ability and clean out for any type of ration. Patented curved carbide knives. Large 58" front door (Side & rear door's available). HD 2 speed Gearbox. Carried by a 3-axle, 12 Tire, spring type suspension.